"Pillowy, fluffy, light frosting that goes well with any cake and holds its shape on cupcakes! Simple ingredients. Old-fashioned is always best; tried and true! Add food coloring for more festive frosting." 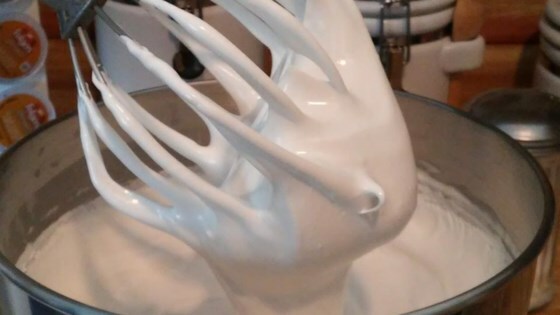 In the bowl of a stand mixer, blend egg whites and salt together in a bowl on medium speed until soft peaks form. Meanwhile, bring corn syrup to a boil in a saucepan; add marshmallows and stir until melted. Raise mixer speed to high. Very carefully, pour the hot syrup in a steady stream between the side of the mixing bowl and the moving beater. Beat until mixture is cool enough to touch; mix in vanilla extract. Makes enough to frost a 9x13-inch cake or an 8-inch layer cake. This recipe contains raw egg. It uses the technique of an Italian meringue, however; the hot sugar syrup should raise the temperature of the mixture enough to pasteurize the egg whites. If you are concerned, you may use pasteurized egg whites instead. Very light texture and taste. Best not to double, I learned the hard way.